Feeling adrift over plate tectonics? Shaky about fault zones? These were just a few of the concerns as 6th grade teachers in San Francisco returned to school with instructions to teach to the standardsspecifically, the California State Science Standards which focuses on Earth Science for 6th grade. Recognizing that many of its teachers lacked expertise in the geosciences, SF district personnel contacted UCMP for assistance. In turn, UCMP contacted many of its geoscience friends and California Landscapes was born. 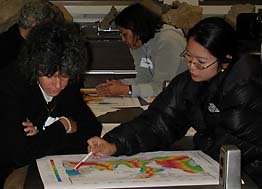 A series of five Saturday workshops followed by a Saturday field trip will include the topics of plate tectonics, earthquakes and volcanoes, the rock cycle, geologic forces, California landforms, fossils, and the geology of San Francisco. 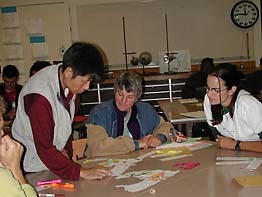 The workshops, which include content, pedagogy, and web-based resources, are taught by Lind Gee, Berkeley Seismological Laboratory; Leslie Gordon, USGS; Ellen Metzger and Richard Sedlock, Bay Area Earth Science Institute (BAESI); Carol Tang, California Academy of Sciences and Research Associate of UCMP; Lisa White, San Francisco State University; and Judy Scotchmoor, UCMP. Nearly 40 teachers are enrolled in the course and will receive course credit from San Jose State University. In addition, the course will be archived on the UCMP website, so stay tuned for the announcement of its debut.